Maritime ports of Chattogram, Cox’s Bazar, Mongla and Payra have been advised to hoist local cautionary signal number three as squally weather is likely to affect the maritime ports, the North Bay and adjoining coastal areas of Bangladesh. “Under the influence of frequent thunderstorm activity, squally weather is likely to affect the maritime ports, North Bay and adjoining coastal areas of Bangladesh. 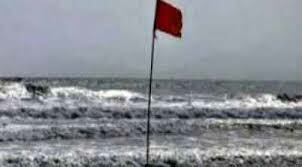 Maritime ports of Chattogram, Cox’s Bazar, Mongla and Payra have been advised to hoist local cautionary signal number three,” said a met office weather bulletin here this afternoon. All fishing boats and trawlers over the North Bay have been advised to proceed with caution till further notice. Besides, the Bangladesh Meteorological Department (BMD) today predicted light to moderate rain or thundershowers accompanied by temporary gust or squally wind at many places over Rajshahi, Rangpur, Khulna, Barishal, Dhaka, Mymensingh, Chattogram and Sylhet divisions with moderately heavy falls at places and hails at isolated places. Night temperature may remain nearly unchanged and day temperature may fall slightly over the country. Country’s highest temperature on Monday was recorded 29.0 degree Celsius at Dinajpur and today’s minimum temperature 14.5 degree Celsius at Sayedpur and Rajarhat in Rangpur division. The sun sets today at 5.59 pm and rises at 6.23 am tomorrow in the capital.